President Barack Obama welcomed Russian President Dmitry Medvedev to the White House on Thursday, boasting that the two men have reset their countries’ relationship in a way unthinkable when Obama took office. But didn’t the Obama administration already do a reset with Russia last year? Russian media has been poking fun at US Secretary of State Hillary Clinton after she gave her Russian counterpart a “reset” button with an ironic misspelling.Clinton’s gift to Russian Foreign Minister Sergei Lavrov at their meeting in Geneva on Friday evening was meant to underscore the Obama administration’s readiness to “to press the reset button” in ties with Moscow. But instead of the Russian word for “reset” (perezagruzka) it featured a slightly different word meaning “overload” or “overcharged” (peregruzka). Well, yeah, but it was a really crappy one. The problem, though, is that all this good will has been bought almost exclusively at Obama’s expense. The United States disappointed allies in Eastern Europe by scrapping plans to station missile-defense batteries in Poland and the Czech Republic, all in order to please Moscow. The Russian occupation of Georgia, America’s best friend in the former Soviet Union, has effectively been acknowledged as a fait accompli by Washington, again to please the Kremlin. At the same time, Washington has remained silent about increasing crackdowns on freedom of assembly inside Russia and the ongoing second trial of oligarch Mikhail Khodorkovsky. And what has Obama bought with all these diplomatic sacrifices? The list is pretty short. Obama’s “reset” is just another empty exercise that allows Obama to pretend that he did something wonderful when in reality he merely failed – again. Ronald Reagan – now widely recognized by the American people to have been our greatest president – had a far different concept of negotiating with a hostile power than Obama does. 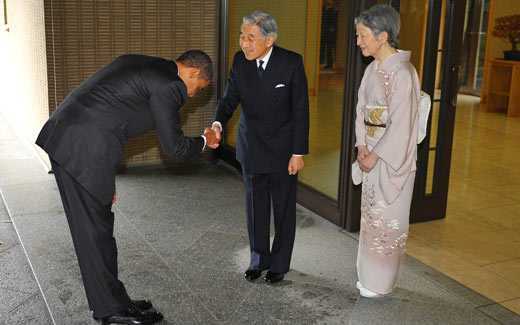 Obama’s is to bow down. I don’t even know what the “bow” count is now. Ronald Reagan spoke of “victory” regarding Russia. One can understand why Obama does not want victory. Losing is far more politically correct than winning, because the loser gets to plead that oh-so-special-to-liberals status of victimhood. And isn’t that worth losing to get? Obama’s misguided mindset is not based on history, as is itself evidenced by the fact that Obama gets his history wrong here when he says Hirohito surrendered to MacArthur. It was the Japanese Foreign Minister who surrendered to MacArthur. Hirohito was nowhere to be seen on the deck of the USS Missouri. The left mocked George Bush for saying he had looked into Putin’s eyes and found someone he could work with. Now they’re proving they are even more naive than Bush was on his most naive day. Obama is now seeing through Joseph Stalin’s eyes (after bowing, of course) and finding the Great Patriotic War. It’s just so neat that Obama agrees with Russia’s historically revisionist view that allying itself with Nazi Germany, plundering Poland and Finland and agreeing to turn the rest of Eastern Europe into slave states, and then fighting the Nazis only after being double crossed was so, so, well, “great” and “patriotic”. Do you think that Ronald Reagan would have gone to Russia and honored Stalin’s “Great Patriotic War”? That is part of the reason why Barack Obama isn’t worth one of Ronald Reagan’s toilet leavings. WASHINGTON — Ten Russian intelligence officers have been arrested in the U.S. for allegedly serving as illegal agents tasked with recruiting political sources and gathering information to send back to Moscow, the Justice Department said Monday. Eight of 10 were arrested Sunday for allegedly carrying out long-term, “deep cover” assignments on behalf of Russia. Two others were arrested for allegedly participating in the same Russian intelligence program within the United States. Ooops. Looks like Obama’s going to need yet a third “reset” with his former KGB buddy Vladimir Putin. Afghanistan is increasingly dangerous for troops and civilians alike, a report says, citing an ‘alarming’ 94% increase in bomb attacks in the first four months of 2010, compared with last year. Afghanistan has become a far more dangerous place for Western troops and Afghan civilians alike, with an increase in suicide attacks, roadside bombings and political assassinations in the first four months of 2010, the United Nations said in a report released Saturday. The gloomy assessment comes on the heels of congressional testimony last week by senior U.S. military officials who acknowledged that efforts to stabilize Afghanistan’s volatile south are proving more complex and time-consuming than anticipated. With the U.S. troop numbers in the country approaching the 100,000 mark, the Western military toll has been rising sharply as the summer “fighting season” unfolds. 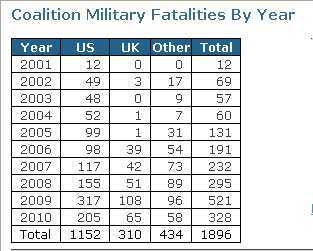 More than 1,000 U.S. service members have died in the nearly 9-year-old conflict. “There has been a great deal of ‘kinetic activity'” as Western and Afghan forces confront insurgents in the south, German army Brig. Gen. Josef Blotz, a spokesman for the North Atlantic Treaty Organization’s International Security Assistance Force, told reporters Saturday in Kabul, the capital. That is the term the military uses to describe battlefield clashes. The U.N. report, submitted by Secretary-General Ban Ki-moon to the Security Council and released by the world body’s mission in Afghanistan, notes a near-doubling in the number of attacks involving roadside bombs. It describes an “alarming” 94% increase in bomb attacks from the same January-April period a year earlier. Roadside bombs planted by the Taliban and other insurgents are generally aimed at foreign troops, but because they are planted on routes used by everyone, they kill and maim many civilians as well. The report also cites an average of three suicide bombings a week across Afghanistan, a growing number of them attacks involving more than one assailant, sometimes in combination with use of rockets, mortars and gunfire. Targeted killings of Afghan officials had increased by 45%, the report says, with most taking place in the south, where the insurgency is strongest. The killings tend to target locally influential figures, such as tribal elders and other dignitaries who might be able to rally villagers and townspeople to resist the Taliban. Western officials have been describing their own campaign in the south as a combined political and military effort, and systematic assassinations appear aimed at sapping the will of local officials and others seen as cooperating with foreign forces or the Afghan government. The U.N. report takes a more hopeful tone about some recent political developments, including nascent efforts by the government of President Hamid Karzai to woo Taliban foot soldiers away from the fight. Let’s reflect on this disastrous report, in light of Obama’s demonization and demagoguery of George Bush’s successful attempt to prevail in Iraq. Condemn him as a failure and a disgrace according to his own demagogic standard. He demonized Bush, when Bush succeeded. How much more should we demonize Obama, as he’s utterly failing??? But this is worse than merely a failure of leadership. Far worse. George Bush selected Iraq as his central front for sound strategic reason. Iraq had a despotic tyrant who supported terrorism. Saddam Hussein needed to be removed to mount any kind of successful peace effort in the Middle East. Iraq is located in the heart of the Arab/Islamic world. It has an educated population relative to the rest of the region. It also offered precisely the type of terrain that would allow American forces to implement their massive military superiority in a way that mountainous, cave-ridden Afghanistan would not. Bush was determined to fight a war where he could win. Obama foolishly trapped us in a war that would bleed us. Why? For no other reason than pure political demagoguery. And he needs to be held accountable. And where are we now under Obama’s failed leadership??? See my piece from last year predicting this failure. Read that article and explain to me where I was wrong, liberals. I dare you. 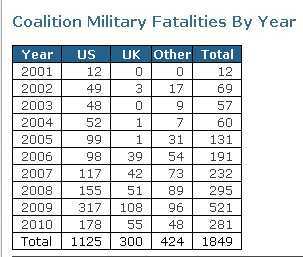 American casualties under Obama in 2009 more than doubled compared to the total in 2008 when Bush was commander-in-chief. And they are set to more than double this year compared to 2009. We’re paying attention to Obama’s massive, massive failure of leadership in the Gulf Coast. That’s all well and good. But don’t forget Obama’s massive failure of leadership in Afghanistan. And just as we should rightly condemn Barack Obama for his demonization and demagoguery of Bush in Katrina, we should likewise condemn him for his demonization and demagoguery of Bush in Afghanistan. We should hold Barack Hussein accountable to his own hypocritical, two-faced standards, and demand his resignation as a failure and a fraud. Update, June 22: Heck, I wrote this yesterday, and hadn’t even published it yet when I discovered I needed to update. Because now we now that Stanley McChrystal, commanding general in Afghanistan, thinks that Obama – and virtually every single man Obama has appointed in Afghanistan – are a bunch of clueless clowns. McChrystal sided with his troops against his Failure-in-Chief once before. I think he did it again to let his troops know that he understands the real problem facing them. Obama agreed to dispatch an additional 30,000 U.S. troops to Afghanistan only after months of study that many in the military found frustrating. And the White House’s troop commitment was coupled with a pledge to begin bringing them home in July 2011, in what counterinsurgency strategists advising McChrystal regarded as an arbitrary deadline. The article portrayed McChrystal’s team as disapproving of the Obama administration, with the exception of Secretary of State Hillary Clinton, who backed McCrystal’s request for additional troops in Afghanistan. It quotes a member of McChrystal’s team making jokes about Biden, who was seen as critical of the general’s efforts to escalate the conflict and who had favored a more limited counter-terrorism approach. “Biden?” the aide was quoted as saying. “Did you say: Bite me?” Biden initially opposed McChrystal’s proposal for additional forces last year. He favored a narrower focus on hunting terrorists. This impulse may well expose Bush to more criticism from Democrats on Capitol Hill, who have sharply condemned him for not listening to Shinseki’s counsel in the beginning. What’s it like to have your own fingers of demonization now pointing back at you? Like I said, Obama is massively failing in Afghanistan. Just like he’s massively failing everywhere else. Update, June 26, 2010: Oh, by the way, get ready for what might be Obama’s “Abu Ghraib moment,” as videos of a mass slaughter of Afghani civilians makes its way to the public. History has an unsavory way of repeating itself. And that is especially dangerous when Democrats are running things. Echoes of Vietnam in a spat that only helps the Taliban. President Obama isn’t faring too well at converting enemies to friends, but he does seem to have a talent for turning friends into enemies. The latest spectacle is the all-too-public and counterproductive war of words between the White House and our putative ally, Afghan President Hamid Karzai. The only winner so far in this spat is the Taliban. The Obama Administration seems to have had it out for Mr. Karzai from the day it took office, amid multiple reports based on obvious U.S. leaks that Vice President Joe Biden or some other official had told the Afghan leader to shape up. The tension escalated after Mr. Karzai’s tainted but ultimately recognized re-election victory last year, and it reached the name-calling stage late last month when President Obama met Mr. Karzai on a trip to Kabul and the White House let the world know that the American had lectured the Afghan about his governing obligations. The public rebuke was a major loss of face for Mr. Karzai, who later returned fire at the U.S., reportedly even saying at a private meeting that if the Americans kept it up, he might join the Taliban. White House spokesman Robert Gibbs kept up the schoolyard taunts yesterday by suggesting that Mr. Obama might not meet with Mr. Karzai as scheduled in Washington on May 12. “We certainly would evaluate whatever continued or further remarks President Karzai makes, as to whether it is constructive to have that meeting,” said Mr. Gibbs, in a show of disdain he typically reserves for House Republicans. The kindest word for all of this is fiasco. American troops are risking their lives to implement a counterinsurgency strategy that requires winning popular support in Afghanistan, and the main message from America’s Commander in Chief to the Afghan people is that their government can’t be trusted. That ought to make it easier to win hearts and minds. Mr. Karzai has been disappointing as a nation-builder, has tolerated corrupt officials and family members, and can be arrogant and crudely nationalistic. Presumably, however, Mr. Obama was well aware of these defects last year when he recognized the Afghan election results and then committed 20,000 more U.S. troops to the theater. You go to war with the allies you have, and it’s contrary to any diplomatic principle to believe that continuing public humiliation will make Mr. Karzai more likely to cooperate. On the evidence of the last week, such treatment has only given the Afghan leader more incentive to make a show of his political independence from the Americans. All the more so given that Mr. Karzai has already heard Mr. Obama promise that U.S. troops will begin leaving Afghanistan as early as July 2011. This shouting spectacle will also embolden the Taliban, who after being run out of Marjah have every reason to tell the citizens of Kandahar that even the Americans don’t like the Afghan government and are short-timers in any case. This treatment of an ally eerily echoes the way the Kennedy Administration treated Ngo Dinh Diem, the President of South Vietnam in the early 1960s. On JFK’s orders, U.S. Ambassador Henry Cabot Lodge refused to meet with Diem, and when U.S. officials got word of a coup against Diem they let it be known they would not interfere. Diem was executed, and South Vietnam never again had a stable government. By contrast, President George W. Bush decided to support and work closely with Prime Minister Nouri al-Maliki during the 2007 U.S. military surge in Iraq. The Maliki government was sectarian and sometimes incompetent, and some of its officials were no doubt corrupt, but Mr. Bush understood that the larger goal was to defeat al Qaeda and to stabilize the country. From FDR to Reagan, Presidents of both parties have had to tolerate allied leaders of varying talents and unsavory qualities in the wartime pursuit of more important foreign-policy goals. Coming on the heels of the U.S. public chastisement of Israel’s government, the larger concern over the Karzai episode is what it reveals about Mr. Obama’s diplomatic frame of mind. With adversaries, he is willing to show inordinate patience, to the point of muffling his objections when opposition blood ran in the streets of Tehran. With allies, on the other hand, the President is unforgiving and insists they follow his lead or face his public wrath. The result will be that our foes fear us less, and that we have fewer friends. I wrote an article yesterday which came out today that recognized this same (quite obvious) point: Obama commits tens of thousands of troops and spends hundreds of billions of dollars in Afghanistan, and then refuses to call the Afghani government an ally? How is that not insane? We won’t lose the war in Afghanistan because of our troops. Our troops are the greatest warriors in the history of the world, and they truly deserve the word “heroes.” If we lose, we will lose because of our failure-in-chief. Turning Afghanistan into the next Vietnam by poisoning the national government is inherently stupid. It is tantamount to refusing to recognize that we are fighting a war against Islamic jihadism. The Bush Doctrine of preventative war stated, “The struggle against militant Islamic radicalism is the great ideological conflict of the early years of the 21st century.” Obama is now fundamentally altering that strategy into one that incredibly refuses to recognize that Islamic jihadism has anything whatsoever to do with terrorism. Obama first refused to use the phrase “war on terror” favoring the neutered (as in “having no testicles”) phrase, “Overseas contingency operation,” and now he is leaving that “overseas contingency operation” with its feet dangling in midair. Just who or what in the hell are we supposed to be fighting??? Every single attack we have faced – be it on foreign battlefields or right here at home – was the result of a radical Islamic worldview. And we’re supposed to pretend that we’re too morally stupid to realize that??? The recent past is a canvass full of examples. Following a long list of Muslim terrorists attempts to create “man-caused disasters” in the US under Obama’s watch, we had a Muslim Army psychologist with “Soldier of Allah” business cards murder a dozen soldiers at a military base while screaming “Allahu Akbar!”. Then we had a Muslim terrorist try to explode a passenger jet on Christmas day. So, yesterday, we had another “incident” on a passenger jet plane. A man from the Qatari embassy named Mohammed Al-Madadi was on his way to visit a convicted al-Qaeda terrorist minion named Ali Al-Marri imprisoned in Denver when he created an international incident by mocking American security authorities by “joking” that he was attempting to light his shoe bomb. But we’re responding by increasingly assuming that Islam has absolutely nothing whatsoever to do with terrorism. Your grandma is a bigger security risk than Osama bin Laden as far as Obama is concerned. Obama once said he didn’t like to think in terms of “victory,” in very direct opposition to every president before him (including Ronald Reagan, who summed up his Cold War goals in four words: “We win, they lose.”). I suppose it’s good that Obama doesn’t want victory, because he will never secure one given his America-despising policies. Obama wanted to relabel terrorism as a “man-caused disaster“; but the only “man-caused disaster” is the Obama administration. While few have said so publicly, there is widespread recognition that a Brown victory in one of the most Democratic of states will go a long way for all Republican candidates, offering the clearest signal yet that voters are rejecting the ambitious Democratic agenda. How did victorious Scott Brown frame his opposition to ObamaCare? When there’s trouble in Massachusetts, rest assured , there’s trouble everywhere, and they know it. One thing is very, very clear as I traveled across this state. People do not want the trillion dollar health care plan that is being forced on the American people, and this bill is not being debated openly and fairly. It will raise taxes, it will hurt Medicare, it will destroy jobs and run our nation deeper in to debt. But the same Democrats who couldn’t understand that Republican Scott Brown was winning in the bluest of blue states of Massachusetts can’t understand what the true ramifications of the stunning Republican victory are. Instead, they are reacting with spin and vowing to redouble their efforts to do the very things that turned the American people against them in the first place. I turned on MSNBC, and it was amazing. According to the evening’s propaganda equivalent to a news broadcast: the race had nothing to do with national issues; Martha Coakley was entirely to blame for running a terrible campaign; Barack Obama is still incredibly popular and powerful, and he brought Coakley up by a great deal – but couldn’t make up for Coakley’s terrible campaign; even though the most liberal state in the union didn’t want ObamaCare, the rest of the nation still did; the Brown “forty-one” seat wouldn’t really hurt the Democrats all that much if they rededicate themselves to their agenda; etc. I have a background in philosophy of religion, and I began to hear what was clearly a liberal theodicy: why does Obama allow evil in the world? The gist of the evening is that Obama is greater than the divine Messiah, and his will and his agenda are perfect, and cannot be questioned. From that starting point, the leftist network began to explain the event of how a candidate running against Obama’s agenda could win a seat held by Democrats since 1952 in the most Democrat state in the country. 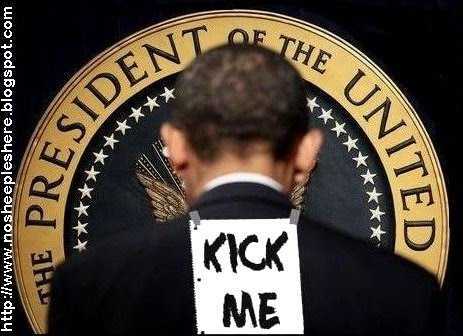 After Obama spent his last 2 cents’ worth of credibility campaigning for Martha Coakley, he didn’t fail – HE CANNOT FAIL!!! The fact that he is now something like ZERO for 5 (Olympics, Jon Corzine, Creigh Deeds, Copenhagen/Climate Change, and now Martha Coakley) is nothing more than a coincidence. Clearly, there had to be some other explanation. It couldn’t be that even people in Massachusetts now recognize that Barack Obama is a failure, and that his agenda is a gigantic boondoggle. It’s not that Obama has shorter coattails than a naked midget; Obama can lower the oceans! It’s not that people are no longer paying attention to a president who has demonstrated that he is an incompetent loser; Obama could call fire down from heaven if he wanted to destroy his opposition. It’s not that Obama’s agenda should now clearly be treated by Democrats like kryptonite is treated by Superman; Obama’s agenda is perfect in every way! And if the people hate Obama’s plan for his world, it is only because they are ignorant and depraved in their sinfulness. They have failed to understand all along. They repeatedly and continually mocked Tea Party conservatives. They demonized the people who voiced their protests and concerns of ObamaCare last August. They trivialized and demagogued any and all opposition to their agenda, as if all those people were some kind of minor nuisance, rather than the voice of the American people. And they just got knocked out with one good punch by “Mister 41,” Scott Brown. For the last 365 days, Democrats have demonstrated that they are like the proverbial lemmings leaping off of the cliff to their political doom. It’s a terrible plan, and everyone pretty much realizes it’s a terrible plan. But, like that poorly-conceived migration route that leads off the steepest cliff in the region, Democrats have to keep pushing and pushing for it. The problem is, that single-minded determination to ruin the country against the clearly-expressed will of the people has come home to roost like [Obama’s Marxist, anti-American, racist reverend] Jeremiah Wright’s chickens. “If Democrats aren’t safe here, they aren’t safe anywhere,” says Alex Castellanos. And now Democrats are suddenly looking every bit like cockroaches with nowhere to run when the light gets turned on. Democrats will either turn and run from ObamaCare, cap-and-trade, climate change, card check, and all the other loathsome elements of the Obama agenda, or else they will get squished. Watching the mainstream media coverage of the demonstrations in Iran following their elections, you would think that the protests have been all about Obama and his Cairo speech delivered on June 4. While President Obama’s speech contained no new policy proposals on the Middle East, he called upon Israelis and Palestinians alike to live up to their international obligations and to work towards a two-state solution. And with all due respects, it’s not like Obama’s devoid of actual policy change “call” ignited the Islamic world. One late night comedic take on the speech a group of terrorists wearing masks and bandoleers of weapons and ammunition listening to Obama’s speech in front of a television. When Obama seemed to say something about offering peace, they got up, “high-fived” one another, and began to take off their weapons. But then, even as they were in the process of taking off their weapons, Obama seemed to say something that went against the grain of his immediately previous statement, so the terrorists shrugged and started putting on their weapons again. Bottom line: the comedic take ended up with the terrorists still armed with all of their weapons, just as they had been prior to the speech. 1. The word TERRORIST. “Violent extremism” doesn’t happen on its own. It’s done by terrorists. 2. Details on closing Gitmo “by early next year.” Surely Pres. Obama realizes that it’s not enough to say “I have ordered the prison at Guantanamo Bay closed by early next year.” Where will those terrorists be sent? What will be the international reaction? Is that a joke?With women being stoned, raped, abused, battered, mutilated, and slaughtered on a daily basis across the globe, violence that is so often perpetrated in the name of religion, the most our president can speak about is protecting their right to wear the hijab? I would have been much more heartened if the preponderance of the speech had been about how in the 21st century, we CANNOT tolerate the pervasive abuse of our mothers and sisters and daughters. Additionally, the statement, “America does not presume to know what is best for everyone” is equivocating on a moral point. America, from its birth, has been a champion of democracy, and should remain stalwart in its position. Did Obama truly think there was little or no difference between the so-called “glass ceiling” women might find in America with the stonings and mutilations of women all-too common in the Islamic world? Obama undoubtedly thinks he is demonstrating historical magnanimity with all these moral equivalencies and self-flagellating apologetics. On the contrary. He’s showing cheap condescension, an unseemly hunger for applause and a willingness to distort history for political effect. Distorting history is not truth-telling, but the telling of soft lies. Creating false equivalencies is not moral leadership, but moral abdication. And hovering above it all, above country and history, is a sign not of transcendence but of a disturbing ambivalence toward one’s own country. How about the hard-fought-for result of an actual democracy in Iraq right next to Iran? How about the fact that Iranians had the chance to see not one, but now several, freely-held elections with Iraqi people being able to victoriously hold up purple-ink-smudged fingers as proof that they had been able to freely vote for the candidates of their choice? Just how is it that Obama’s speech is somehow more important than that? Let’s not forget the fact that neither Barack Obama nor the mainstream media wanted the Iraqi people to be able to freely vote for the candidates of their choice. They opposed the toppling of dictator and tyrant butcher Saddam Hussein – who had murdered at a minimum 400,000 of his own people and buried them in mass graves – having the opportunity to vote that George Bush and the magnificent American military courageously won for them. And these same people who opposed the establishment of an Iraqi democracy in the heart of the Arab world are now telling you that a damn SPEECH filled with meaningless moral equivalencies and devoid of substance or policy accomplished a change in the heart of the Iranian people? The mainstream media gleefully covered every death and every failure in Iraq and continued to cover it – until President Bush and the American military began to turn things around. And then the coverage dried up. These dishonest peddlers of propaganda were unwilling to represent the effort in Iraq as successful. You can go back and find the left predicting in 2003 that “Bush’s declared attempt to introduce democracy in Iraq by force seems set to fail.” In 2005 the naysayers who called hope for democracy in Iraq “the province of fools” abounded. Then you can find media elites in 2006 suggesting that the elections in Iraq are good news, but still not as good as it should have been. Now we have a full-fledged stable democracy in the heart of the Arab world, and it is seemingly irrelevant to whatever positive pro-democracy changes that might be taking place immediately around Iraq. The mainstream media allowed the Democrat Party to literally cut-and-run from its earlier positions on Iraq without coverage or analysis. Democrats were allowed to be for the deposing of Saddam Hussein before they were against it. Democrats like Senate Majority Leader Harry Reid were allowed to claim “I believe that this war is lost“ while our troops were still fighting on foreign soil to secure victory. Say what you want to say about the administrative debacle the situation became after Saddam was ousted, but Saturday’s endeavor is a sign of a better Iraq in a region infested with despots and tightly-gripped political systems, where elections, if allowed, are not that different from those held under Saddam – sham, corrupt and pointless. Arab regimes across the Middle East and Arab people around the world who bristled when they saw Saddam toppled, and later executed — and who may still easily shrug off Iraq’s elections as unconstitutional for being held under U.S. military occupation — have a right to know what it means to have a sense of hope. True, Iraq was safe under the Baath regime and walking in Baghdad at any time of the day felt to me even safer than walking in some parts of New York now, but give me any police state in that region or elsewhere that doesn’t enjoy a relative sense of protection. Hillary Clinton was for that war before she was against it. And the mainstream media – dishonest, deceitful, and disingenuous itself – allowed Hillary Clinton to be dishonest, deceitful, and disingenuous. But the mainstream media allowed Nancy Pelosi to get away with the outright moral depravity of attacking President George Bush as a liar when she had publicly held the very same positions herself. And now we have these same deceitful, dishonest demagogues ignoring the hard-fought accomplishments won under George Bush, and crediting an empty speech as the driving force behind any changes in the Islamic world. Following the beginnings of the Iranian public demonstrations, even in the aftermath of public statements of condemnation by European leaders, Barack Obama had failed to take a public stand. EVEN FRANCE HAD DISPLAYED MORE COURAGE IN STANDING BEHIND THE IRANIAN PEOPLE THAN OBAMA. Congress voted resoundingly Friday to condemn the Iranian government’s crackdown on protesters, sending a strong bipartisan signal to the White House that it wants less caution and more outrage. Obama hasn’t been at the forefront of democracy for Iran; he has in fact been the Western and American leader most behind on the issue of supporting true democracy in Iran. But we’re supposed to believe that it was an empty-worded speech from an empty suit on foreign policy that is rocking the Iranian world? Don’t believe it for a nanosecond.